- General Douglas Haig issues an Special Order of the Day to his 1st Army, announcing the offensive that is to be launched tomorrow morning. In contrast to the ad hoc fighting of the past six months, especially during the 1st Battle of Ypres, this operation will be the first planned, set-piece attack undertaken by the British on the Western Front. Meticulously planned, it constitutes the first sustained effort to deal with and overcome the stalemate of trench warfare. The initial phase is the capture of the village of Neuve Chapelle, to be undertaken by 8th Division and the Meerut Division, and is to be followed by a general advance of IV and Indian Corps to Aubers Ridge and beyond. Simultaneously, I Corps to the south and the Canadian Division to the north will conduct diversionary operations to pin the German forces opposite; for the Canadians, this will be their first significant taste of combat since coming into the line on March 3rd. Similar to the other major combatants, the British are experiencing a shortage of artillery ammunition, so Haig intends to make a virtue of necessity by concentrating the preliminary bombardment into an intensive thirty-five minute barrage. After the preliminary bombardment the initial attack will be launched over a narrow two-thousand yard section of the line, the hope being that concentrating the bombardment and attack on such a small stretch of the front will allow the British to overwhelm and break through the German defence. The planning of the operation has been aided by comprehensive aerial reconnaissance of the German lines, allowing for detailed maps to be issued to officers illustrating the German defenses up to fifteen hundred yards behind the first trench line. Despite the detailing planning and high hopes, the leadership of the BEF is well aware that even the most successful of attacks will incur substantial losses. Writing to a friend today, Sir John French anticipates that five thousand will be killed in the attack, and is disturbed at the thought that these men will march to their deaths at his orders. - Today the Austro-Hungarian Foreign Minister submits a proposal to the Italian government regarding territorial adjustments to be made should Italy remain neutral in the war. The deteriorating military position in the Carpathians has finally convinced the Emperor and his ministers that some offer is necessary to mollify the Italians. Their proposal is to surrender the Trentino, a territory in the Alps and home to a significant Italian population. However, the transfer is not to be effected until after the end of the war. - The Entente has occupied the Greek island of Lemnos, located about forty miles southwest of the Dardanelles, in order to use the port of Mudros as their base of operations. With the dismissal of the pro-Entente Venizelos, the Greek government has asked the British government for an explanation of this violation of Greek territorial integrity. In reply today, the British can only offer the justification used by combatants throughout history: necessity. 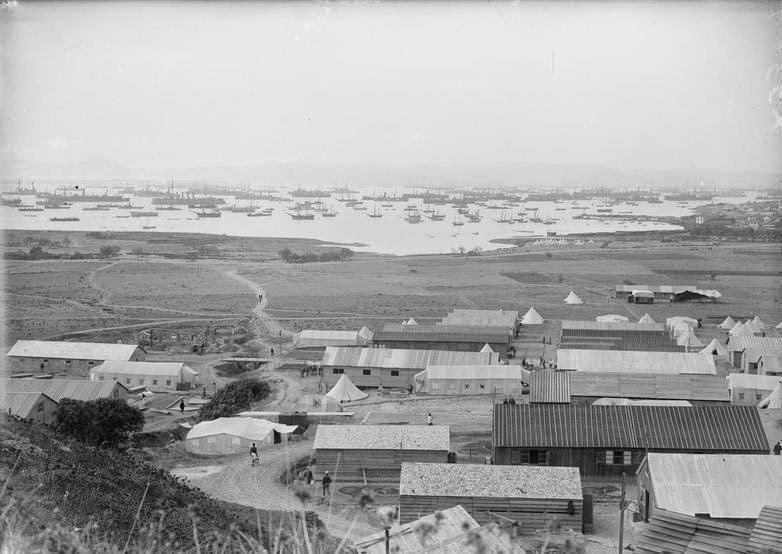 The harbour at Mudros, with a French hospital in the foreground.